Do you have a leaky roof? Don’t let a small roof leak turn into a bigger and more expensive roof repair problem. Call Keystone Contracting LLC to repair your leaking roof and fix your roof drainage problems. Our friendly and knowledgeable crew at Keystone Contracting LLC will work with you to ensure your roof is repaired quickly and properly. 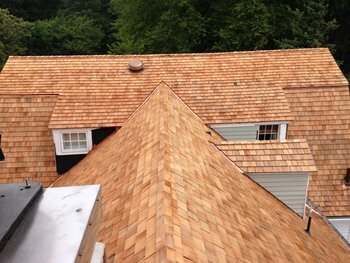 Keystone Contracting LLC performs roof repairs for a variety of roof types. Do you have curling roof shingles, damaged slate or cracked roof tiles? Do you need flat roof repair? Whether it’s repairing a shingle roof, fixing flat roof leaks or repairing roof tiles, our experienced tradesmen will fix and restore your roof promptly to help defend your property once again from the elements. We can match any material. Don’t hesitate to call Keystone Contracting LLC once you see the first sign of a leak or stain on your ceiling or roof. You have our commitment to top quality customer service and a guarantee that we will repair your roof to your utmost satisfaction and at fair price. Find out today how Keystone Contracting LLC can fix your roof. Roof repair is our specialty. Don’t let the leaks damage your roof or property. Keystone Contracting LLC will repair roof leaks of any size at a time which is convenient to you!